“I am calling for the sack of the Acting Chairman of the EFCC, Mr. Ibrahim Magu, for overthrowing a tier government. The mere fact that the two accounts have been re-opened does not mean that a crime was not committed,” Governor Wike reportedly told journalists, Thursday, in Port Harcourt, according to a Government House press statement. 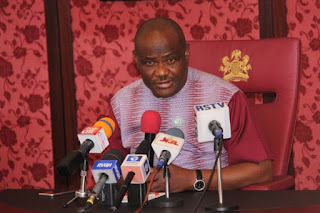 Mr. Wike said the EFCC, as an agency of the All Progressives Congress (APC)-controlled federal government, went after Benue state government because of the defection the state governor, Samuel Ortom, from the APC to the Peoples Democratic Party (PDP).